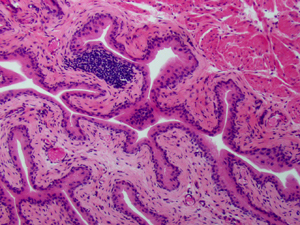 In mice, an immune system overreaction to a urinary tract infection can leave the lining of the bladder pocked with clumps of inflammatory immune cells (in this image, the dark clump on the upper left). Researchers at Washington University School of Medicine in St. Louis showed that this can shift the balance in the bladder from a protective immune response that helps prevent infection to a damaging immune response that makes mice more vulnerable to recurrent infections. Researchers showed in mice that severe inflammatory responses to an initial UTI cause bladder damage and allow infection to persist longer. After one to two weeks of infection, the bladder wall undergoes additional changes that leave mice more vulnerable to later infection. Suppressing the immune system during initial infection decreases these vulnerabilities, they report Aug. 12 in PLoS Pathogens. The research was conducted at the Center for Women’s Infectious Disease Research at the School of Medicine. UTIs affect millions of people each year. Although antibiotics are the primary treatment, antibiotic resistance is a growing concern, according to Scott Hultgren, PhD, the center’s director. Symptoms include frequent, painful urination, blood or cloudiness in the urine and fatigue. Hultgren’s lab has shown that bacteria can cause multiple bouts of UTI symptoms by going into a dormant state in the host and reactivating months later. In the study, researchers infected mice with UTIs for a month. Some mice spontaneously resolved their infections; others developed a persistent infection that Hultgren’s group calls chronic bacterial cystitis. These mice persistently had high levels of bacteria in their urine and bladder and high levels of inflammation in the urinary tract. In one experiment, mice were treated with antibiotics after four weeks of UTI to eliminate the bacteria. Researchers then exposed mice to other UTI-causing bacteria that they could distinguish from the initial infectious bacteria to see how the mice would respond to a subsequent infection. Forty percent of mice that had signs of chronic bacterial cystitis in the initial challenge developed it again. Mice who never progressed to chronic cystitis or defeated the infection on their own did not develop chronic bacterial cystitis in the second challenge. Symptoms were more severe in mice with recurrent chronic infections than in recurrent infections that were rapidly cleared. In mice more vulnerable to recurrent chronic infection, inflammatory immune cells had infiltrated bladder tissues. Inflammatory cells were still visible up to a month after infections were treated and cleared. Mice that had chronic bacterial cystitis in the first round of infection but avoided it in the second had little or no bacteria in their urine during the second test. Hannan says this suggests that they may have antibodies in their urine directed against UTI-causing bacteria. Hultgren and colleagues are currently testing vaccines designed to provoke a similar mouse immune response. Investigators in Hultgren’s laboratory are also collaborating with researchers at the University of Washington and Duke University to see if the mouse results can lead them to markers of vulnerability to recurrent infection in humans. Hannan TJ, Mysorekar IU, Hung CS, Isaacson-Schmid ML, Hultgren SJ. Early severe inflammatory responses to uropathogenic E. Coli predispose to chronic and recurrent urinary tract infections. PLoS Pathogens, Aug. 12, 2010. Funding from Office of Research on Women’s Health, National Institute of Diabetes and Digestive and Kidney Diseases, National Institute of Allergy and Infectious Diseases and the National Cancer Institute supported this research.